If a picture is worth a thousand words, then these albums should leave them speechless! That is the tag line from Iris & Lily's website, and we think it is perfectly fitting for their product. Iris & Lily is a unique small business that creates keepsake albums with a personal touch. Your image encompasses the front of the album combined with your choice of accent fabric creating a one of a kind unique keepsake albums. 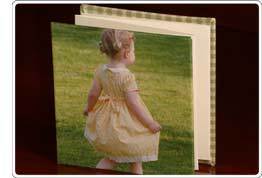 Choose from a Paper Page Album, Photo Sleeve Album or Accordion Album, submit your image, choose your fabric and there you have the perfect custom album - a great gift for yourself or just about anyone.